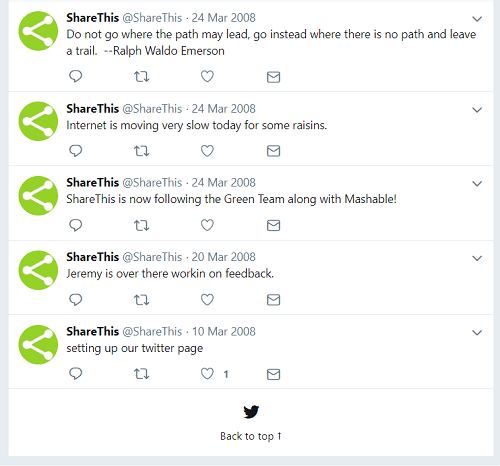 Whether you’re wondering what you had to say about a particular subject back in the day or wanting to clean up your Twitter history (removing any, ahem, embarrassing tweets you may have sent), there are several ways to go about finding your old tweets. You can even easily find the first tweet you ever sent. Here’s how. The simplest but most time-consuming way to find your old tweets is to visit your profile and scroll back to your old tweets in your timeline. If you’re a prolific Twitter user, however, this is a task that could take considerable time. 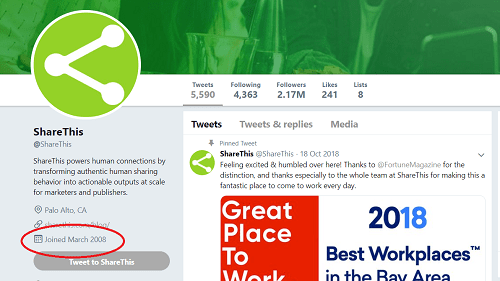 Here at ShareThis, for example, we’ve tweeted more than 5,500 times. That’s a lot of scrolling! The other hiccup with this method is that Twitter only allows you to scroll back to the past 3,200 tweets, so if you’re like us and have tweeted more than 3,200 times, you won’t be able to manually scroll back to the very beginning of your timeline. So, if you’re in search of your first-ever tweet, the scrolling method won’t work. Now, if you really want to be thorough, you can request your full archive from Twitter. 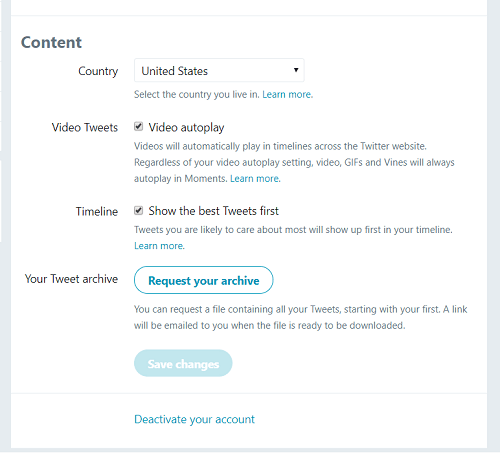 Go to your Settings, then scroll down to “Content” and click the button that says, “Request your archive.” Twitter will email you a link when your archive is ready to be downloaded. Your archive will include every tweet you’ve sent, including retweets, starting from the beginning. This method brings up a list of your previous tweets, but that’s not the most useful way to go about it if you’re looking for tweets from a certain time or on a particular subject. Adding more search parameters can help you narrow down the results. If you want to find your old tweets from a specific date range, scrolling through your timeline isn’t the most efficient method. The good news is you’re not limited to using your username in the Twitter search bar – you can add other search parameters, too, including a date range. Go to the Twitter search bar. Hit enter (or click the magnifying glass icon in the search bar). Voilà! You now have a complete list of every tweet sent from your username (or any username) between the dates you specified. One thing to keep in mind: The default view is “Top,” meaning you’re seeing your top tweets from that time period. Click “Latest” in the navigation bar to view those same tweets in reverse-chronological order. Hit enter or click the magnifying glass icon in the search bar. Click “Latest” in the top navigation bar. Scroll to the bottom to find your very first tweet. 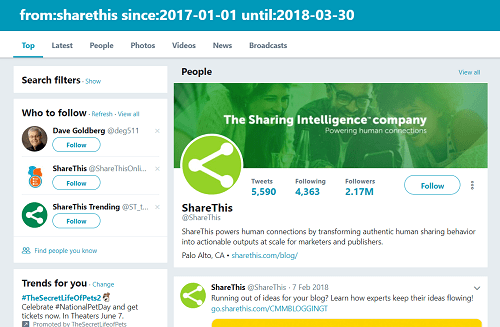 Twitter also has an Advanced Search tool that makes it easy to conduct date-range searches and find old tweets from your own profile or another user on a particular topic, tweets tagged with a certain location, and even tweets on a topic from several users with a single search. To search by topic, type in your keywords using the available fields. You can search for tweets containing a close match to a word or phrase, tweets containing only an exact match for your specified phrase, or tweets containing specified hashtags. If you’re using Advanced Search to find tweets sent during certain dates, use the “Dates” fields to enter the starting and ending date for the period you want to search. 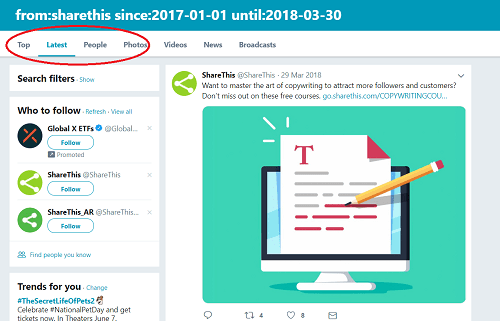 If you want to find your first-ever tweet using Advanced Search, find the date you joined Twitter and enter that date into the “From” and “To” fields. This assumes, of course, that you actually started tweeting on the date you joined. If that’s not the case, you might come up empty-handed unless you expand your date range a bit. 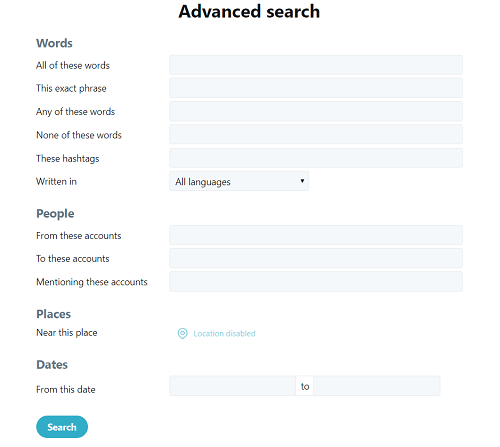 The beauty of the Advanced Search tool is that you can use as few or as many fields as you like, so it’s easy to quickly find tweets on a topic sent on a given day or during a certain week. It’s a great tool for competitive analysis, too. If you’re conducting research for a blog post, evaluating opinions about a product launch, or performing social listening, such as looking for reactions to an industry conference (along with myriad other potential use cases), Twitter’s Advanced Search is your new BFF. Whether you’ve sent a few dozen tweets or thousands, growing your audience on Twitter is one of the best ways to get more traction from your content. Install the Twitter follow button today to start growing your Twitter audience – it takes just seconds to install, so you can start growing your followers today!